Jack P. Becker, 80, of Antoine Drive, Port Washington died June 11, 2012 at Clement J. Zablocki VA Medical Center in Milwaukee. He was born on November 13, 1931, son of Elmer and Margaret Lorge Becker in Port Washington. A lifelong resident, Jack graduated from Port Washington High School. On February 21, 1952, he entered the US Army during the Korean Conflict. Achieving the rank of Sergeant, Jack became Section Chief. During this time he suffered percussion deafness, which would remain with him throughout his life. He was discharged on November 20, 1953 and returned to Port Washington and his job at Bernie’s Fine Meats which he started during high school. On April 16, 1955 he married Caryl J. Klemm of Port Washington at St. Mary’s Catholic Church in Port Washington. They raised their family on Sauk Drive for many years. 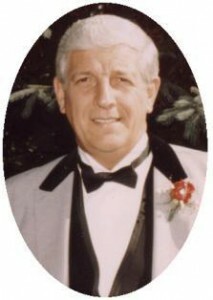 Jack had a long career with the Kohl’s Food Stores throughout Wisconsin. Over 23 years he was a buyer, active in sales and held numerous positions throughout the company. Later he worked sales and marketing for Strauss Veal Products of Franklin, retiring in 1993. He had been a City of Port Washington Alderman, probably the youngest at the time at the age of 29. Jack will be remembered for his wit and sarcastic sense of humor. He was quite the sun worshipper and spent his time on his deck and winters in Destin, FL. Quite often he would start the day with a sunrise meditation on the Port Bluff. He was a voracious reader and active at the WJ Niederkorn Library. Always a Packer fan, cheering them on at Lambeau Field. Jack was a member and former commander of the Van Ells-Schanen American Legion Post 82. He enjoyed the camaraderie of his buddies. In 2005, he was acknowledged by Port Washington High School in their Veterans Wall of Honor. He enjoyed collecting eagles and tending his flower garden. He is survived by his wife Caryl, children Lauri Trad of Sheboygan, Dave (Connie) Becker of Menomonee Falls and Lynn (Brian) Becker Reardon of Alexandria, VA; five grandchildren Evan Trad, Jacob and Lee Becker and Jack and Hadley Reardon, his sister Anna (the late Greg) Lanser of Port Washington; sisters-in-law Rosemarie Waldkirch of Fredonia and Kristine (Randy) Krentz of Sheboygan, further survived by many nieces, nephews, other relatives and friends. He is preceded in death by two brothers Harold Becker and George and wife Ruth Becker. A Memorial Mass will be celebrated at 6PM Thursday, June 14 at St. Mary Church, 430 N Johnson St., Port Washington. Reverend Thomas Lijewski will be the celebrant. Visitation from 3:30-6PM Thursday AT CHURCH with a 3:30 Rosary. Interment held at St. Mary’s Cemetery Port Washington with military honors by the US Army, Van Ells-Schanen American Legion Post 82 and Ozaukee Memorial Post VFW 5373.